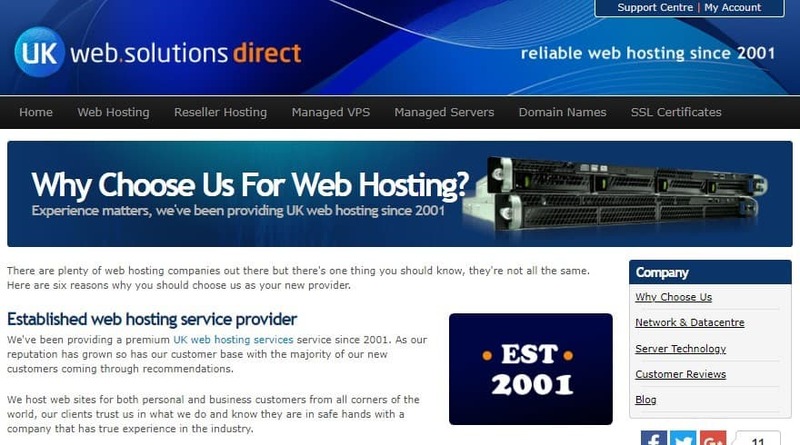 UK web solutions direct Review 2019: Is UK web solutions direct a Good Hosting? UK Web.Solutions Direct is a web hosting provider with data centers in Manchester, England. They offer, among other services, shared web hosting, VPS hosting, dedicated servers, reseller hosting, and SSL certificates for businesses of all sizes. UK Web.Solutions Direct is a hosting provider with headquarters in Manchester, England. Established in 2001, they offer a complete line of feature-rich hosting solutions that include shared web hosting, VPS hosting, dedicated servers, reseller hosting, and SSL certificates. It is worth noting that as of May 2014,UK Web.Solutions Direct became a subsidiary of M247 Limited. UK Web.Solutions Direct uses top-notch hardware; their servers are mounted on high-performing Dell racks and use RAID disk mirroring with a fully redundant network. Their shared web hosting uses high-end Linux servers with Cloud Linux operating system for maximum stability and reliability. Each website hosting space has its own lightweight virtualized environment (LVE) and is given a predetermined amount of resources. This makes it practically impossible for a single website to bring down a web server. UK Web.Solutions Direct has designed two types of backups. The first backup is their standard cPanel data backup performed on the servers themselves. The second backup is the Idera CDP data backup system that is performed by their own servers that are separate from the main servers. The setup for cPanel VPS servers is exactly the same as their shared web hosting and reseller plans, which makes upgrading and downgrading quite easy. All UK Web.Solutions Direct WHM reseller accounts come with Installatron, allowing you to install over 60 free scripts including Joomla and WordPress, directly from your control panel. UK Web.Solutions Direct packages are offered at a cheap price with no setup or hidden fees. The features included in their plans are quite advanced, ideal even for hosting big companies. You can subscribe to their plans on monthly or yearly terms. However, the minimum contract term for dedicated server solutions is six months. Among other things, the contract requires the customer to give 30-days notice if they want to terminate their subscription. UK Web.Solutions Direct gives no uptime guarantee, but they provide a seven-day full refund if, for whatever reason, you’re not satisfied with their services. You can get in touch with the UK Web.Solutions Direct support team via telephone, email, or ticketing system. They have no live chat but their support team is available 24/7. What’s more, most of their clients are happy with their technical support team. When contacted, the team responds fairly quickly and they come across as having the relevant expertise to deliver excellent support services to their customers. UK Web.Solutions Direct also has a resource-rich knowledge base that includes quite a number of blogs, tutorials and frequently asked questions. UK Web.Solutions Direct’s cheap shared hosting solutions make it quite popular with small and medium-sized businesses in the U.K. They also have considerably flexible and reliable VPS and Dedicated Server solutions, a clear testament to their excellent hosting solutions. Purchase excellent U.K. hosting at UK Web.Solutions Direct! 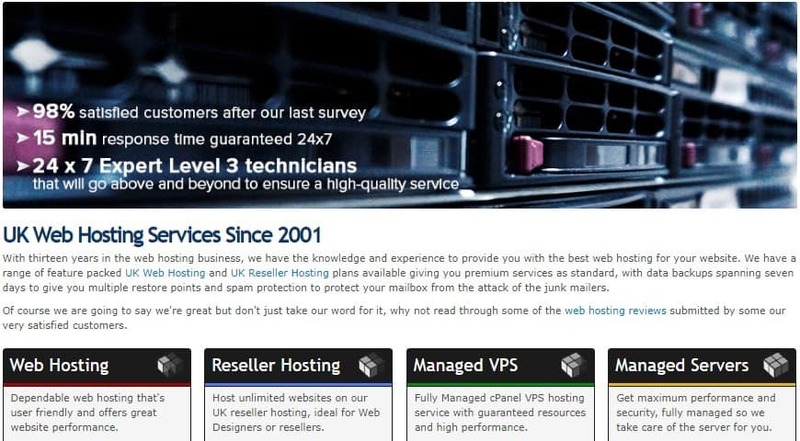 Wondering how UK web solutions direct stacks up against other Web Hosting companies? Enter any other Web Hosting company and we will give you a side-by-side comparison.